This weeks grocery haul was another small one. I have meat in my freezer that I'm working through and I worked hard to avoid the meat aisles at the store in case I saw a deal I couldn't pass up.. Ha, ha! I want to use up some of what I already have to keep a good rotation going, and to free up space in my freezer. This weeks haul was from WinCo. We did not need to go to Costco. I needed to restock my salad veggies. I bought baby spinach, romaine hearts and cabbage. I like the nutritional value from those greens and the fact they make a pretty colored salad. I guess I like my salads looking pretty and appealing to eat. :) It's so easy to make veggies an afterthought with meal planning. And as I've looked at a few other blogs and YouTube's I find it interesting, sometimes, at how few fresh veggies people eat. I also picked up tomatoes, mushrooms and a green pepper for the salads. I still had a cucumber and beets left in the fridge. 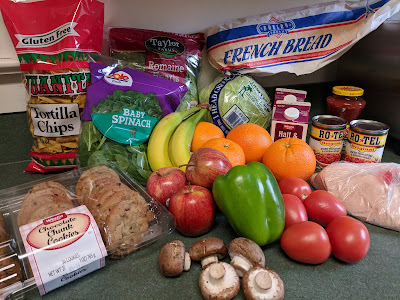 The rest was a few basic items, half-n-half, fruit, tortilla chips (my hubby's favorite brand was on sale), salsa, cookies, a loaf of french bread to go with our spaghetti this week and they had Rotel tomatoes on sale so I picked up a couple for the pantry. One thing I love about Winco is that they have a large bulk section with an amazing variety of foods. I use to purchase my Himalayan Pink Salt online from Amazon. Then WinCo started selling it in the bulk section. 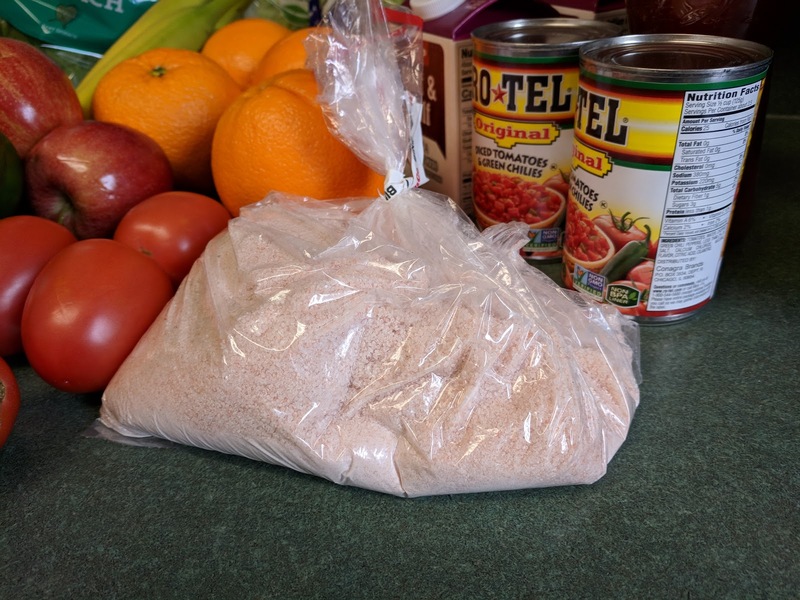 I was almost out of salt so I picked some up.... the cost is $2.26 a pound which is less then most of the brands I see on Amazon and much more convienient. This recipe is simply a variation of your basic chicken noodle soup. 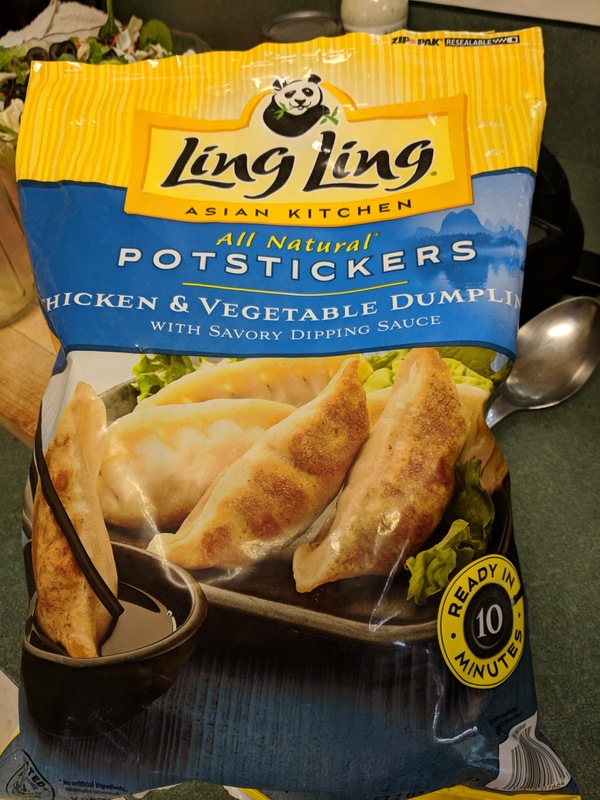 Instead of noodles I use frozen potstickers. I buy mine from Costco. You can make it with whatever cut of chicken you would like. I often buy a big package of chicken legs to have on hand. I use the legs to make the soup. The bone in chicken gives the broth a nice chicken flavor, it provides plenty of meat for the soup and is economical. When I don't have chicken legs in the freezer I'll also use chicken thighs or breast. Basically whatever you have or fits your budget. 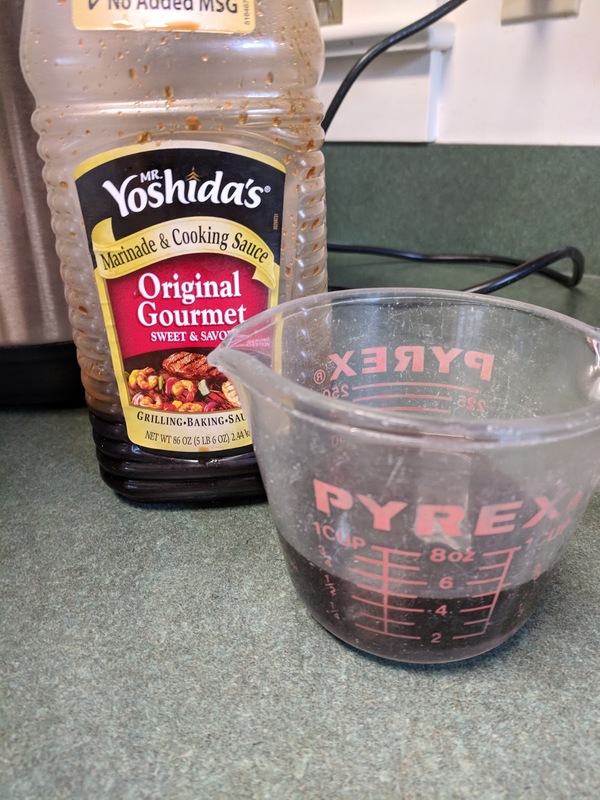 And to give it that Asian twist I add some Yoshidas Sauce to it at the end. I make the soup in my Instant Pot. But this could easily be made on the stove top. Instructions are given for the Instant Pot. 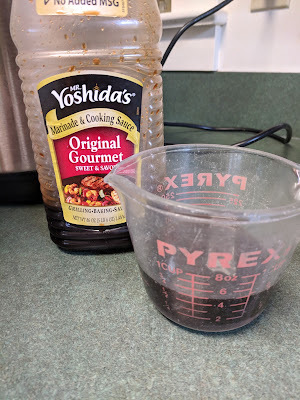 You can do this on the stove top as well by adjusting the cooking times. In the Instant Pot combine chicken, water, onion, carrots garlic and salt. If you are using legs you can cook them for about 30 minutes to get as much of the nutritional value and flavor in your broth as possible. If you are using thighs or breast then about 12 to 14 minutes. Do a quick release of the pressure when you are done. Using a slotted spoon remove the chicken and let cool. Debone the meat after it has cooled if you are using legs, or shred the meat if using thighs or breast meat. Set this aside. In the broth add the Yoshidas sauce and the frozen potstickers. Put the lid back on the IP and set it for 5 minutes. When the time is up release the pressure (Quick Release, QR) and serve. You can taste to see if it needs more salt according to your own taste. 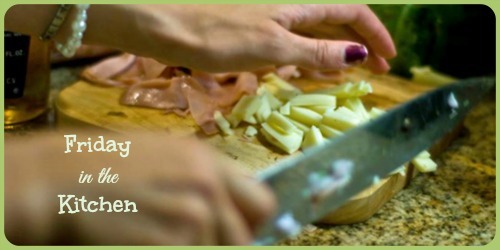 **you can also use frozen veggies instead of the carrots. 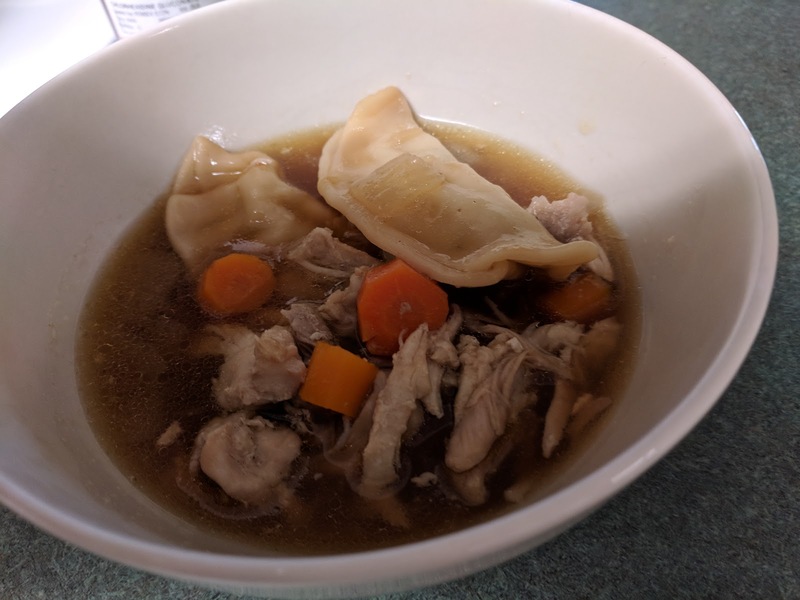 If I do that I usually add them in when I add the potstickers in the broth.